Met some amazing young beauties this weekend at the Boxing for Boobies Breast Cancer event at Title Boxing Club in Wayne. Sweet, talented, hard-working, compassionate. Love the youth of New Jersey!! Jessica Indio: Sporting my #StarDog shirt today. Thank you for letting me contribute to a worthy cause with this shirt. CONGRATULATIONS TO ALL THE WINNERS AND TO THE AUTISM AWARENESS COMMUNITY!!! PRLog (Press Release) - Oct. 27, 2013 - LINDENHURST, N.Y. -- On Friday, October 25, 2013 New York Institute of Beauty presented to a Sold out Gatsby theme Beauty Gala Event at Chateau La Mer to raise awareness for Autism. Oct. 27, 2013 – Lindenhurst, N.Y – Each year New York Institute of Beauty, and Long Island Beauty School host a competition in make-up, hair, and nails to support and raise money on behalf of Team Jack-Autism Speaks, Long Island Chapter. This year, the New York Institute of Beauty Make Up Team organized a Beauty Gala Event for Team Jack-Autism Speaks, Long Island Chapter at Chateau La Mer in Lindenhurst, New York. The theme of the event was Gatsby and since it was the weekend before Halloween, New York Institute of Beauty encouraged guests to come in their best Gatsby attire. The event provided cocktail hour, a dinner buffet, dessert, cash bar, raffles, a 50/50 and an amazing Wild Cherryz burlesque dance performance and Red Carpet Appearance by singer Nick Tangorra. Drag Super Star Xtah C Extraordinaire was a guest celebrity judge. Trophies were awarded to the winners for each competition plus something of monetary value for example, $500 towards advance make up classes, $250 in Make-up, or $500 in hair products, etc. The Beauty Gala Fundraiser for Autism a Gatsby inspired event raised and donated $10,300. Owner of Chateau La Mer, George Voutsinas- Thank you for his generosity, amazing food, beautiful venue and first class service. At the New York Institute of Beauty, they are delighted to offer educational opportunities in this dynamic field! New York Institute of Beauty is dedicated to a high level of education for their students and to the continued accomplishments and success of their graduates, so he or she may find gainful employment in the appearance enhancement fields. We didn't have ghosting in my town when we were kids, but it is a Halloween tradition that my kids have grown to love over the past several years. I love how it gets the children in the mood for Halloween and how it is an other outlet for giving versus receiving. It starts early in October so the whole neighborhood has a chance to get ghosted. 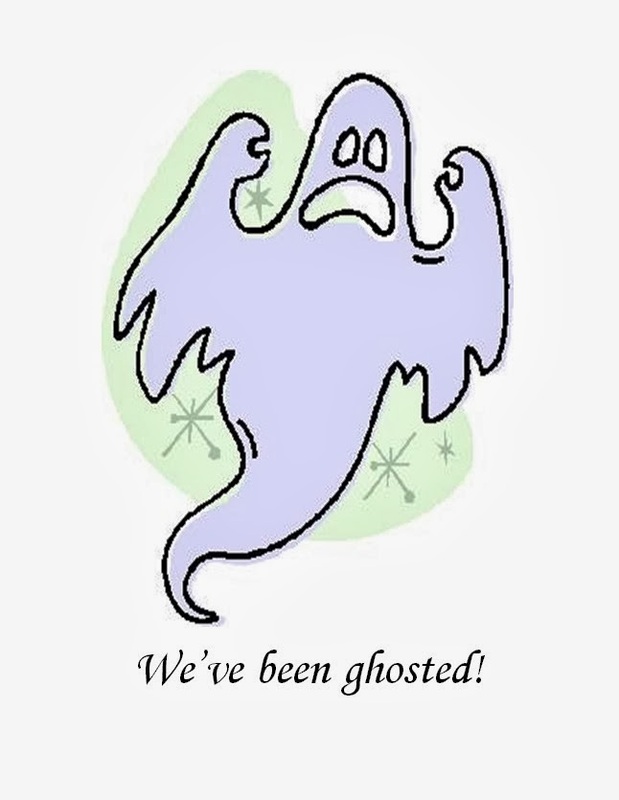 To ghost someone you must put together 3 scare bags filled Halloween candy or trinkets, a picture of a ghost and a letter stating that you’ve been ghosted with instructions on how to carry on the tradition. You wait till after dark and go up to your targeted houses, drop off your scare bags, ring the doorbells and RUN! The goal is to not get caught. Once you get ghosted you tape the picture of the ghost in your door or window, so people know that you have been ghosted. As soon as October hits, my kids are eager to get started. We fill paper bags with candy and treats, sometimes plastic spiders, balls, anything fun. We include a copy of the letter ( which I printed below - or you can make up your own) and picture of the the ghost. Even though the tradition says for each neighborhood family to pick three houses, we love it so much, that I let our kids pick three friends each. My kids go as far as dressing head to toe in black. The goal is to not get caught, but my kids have found it extremely fun on the rare occasion that they do. As ghosting becomes more popular, not getting caught is becoming somewhat of a challenge. We have serious ghosters in my house. They make list, and have escape routes in place before dropping off the bag of treats. I can almost hear their little hearts beating out of their chest as they sneak up to the front doors, crouch down to not be seen under the light of the window. They ring the bell and shriek and giggle as they high tail it out of there. Ghosting provides a family fun night out. I think I have just as much fun as them as I drive the get away car. The ghosting in our town how just begun for the year. I think I just heard my doorbell ring, again. It is a tradition we hope you will repeat. Be safe, be quick, and stay out of sight. Let’s see if we can hit every house before Halloween night. Now I am Curious, Have you ever been ghosted? No Ghosting in your town....time to start up the tradition! Thank you, once again, to Stephanie Ferrante Photography for not only taking beautiful shots at our Give Back New Jersey event but also for this awesome article!! Our friend, Cara Zamorski, writes about her night with us at the "Give Back New Jersey" event hosted by Star Dog. Check out her Event Fling! article on her Fashion Swain blog. Our Friend, Yessenia Ramos, writes about her night with us at the "Give Back New Jersey" event hosted by Star Dog. Check out Star Dog “Give Back New Jersey” Launch and Jewelry Party with Melissa Gorga on her Mommiez Fashion Diary blog. Our Friend Lea Rannells writes about her night with us at the "Give Back New Jersey" event hosted by Star Dog. Check out "Star Dog Brings out Star Power" in her Model Behavior Bytes blog.